March 31, 2015, 8:32 a.m. March 31, 2015, 8:32 a.m.
Insurance Revolution staff have ensured that more than 100 children have an egg-cellent Easter – by donating 106 chocolate eggs and bunnies to charity. 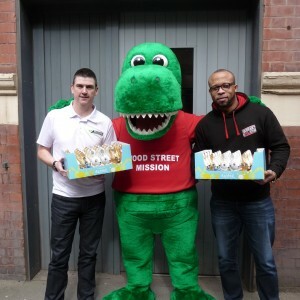 The chocolate treats have been gifted to Wood Street Mission (WSM), which works tirelessly to help families affected by poverty in Manchester and Salford. Insurance Revolution and its associated brand, Well Dunn Insurance, first became involved with WSM last Christmas, when every staff member donated their December bonus to the organisation – which equated to £3,000. So when it came to the company’s involvement in WSM’s Easter Appeal, Insurance Revolution and Well Dunn director, Paul Dunn, decided he would take the lead. 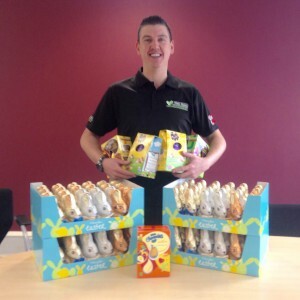 Paul challenged staff to sell as many new business policies as they could and promised he would match each one with a donation to Wood Street Mission, in the form of a chocolate bunny. The sales teams took the challenge to heart and sold 96 new business policies between March 16 and March 20 – which equalled 96 chocolate bunnies. Staff were keen to make their own donations and some brought in their own chocolate eggs – bringing the chocolate total to 106. Paul Dunn, Paul Chambers; Well Dunn Insurance team leader and James Opera; Insurance Revolution insurance advisor, popped into Wood Street to drop off the donations on March 30 – with Paul Chambers even dressing up as the charity’s mascot, Woody the dinosaur, for the occasion. WSM will donate the bunnies and eggs to children affected by poverty as part of its annual Easter Appeal, which helped more than 2,000 children last year. Insurance Revolution’s head operating officer, Mark Rigby, said: “We’re absolutely delighted to be working with Wood Street Mission once again, it’s an amazing charity which does great things for the local community.